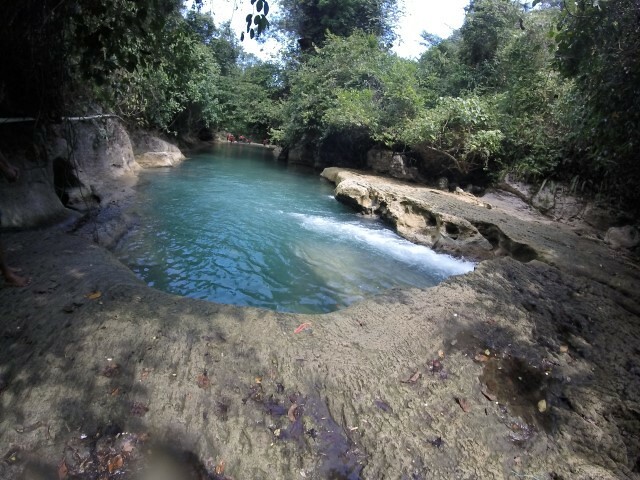 Upon arriving in Pangandaran, all of the fellow backpackers at our hostel suggested we take the Green Valley/Green Canyon tour. We had initially anticipated that tours would be expensive and not worth the money, but they assured us that it would be a great time. We signed up and the next morning we were off on a whirlwind adventure that will be on my top 10 favorite things I’ve done for a long time. In the morning, we were given 2 helmets and a scooter. We followed Din Din (our tour guide) to another hotel to pick up the rest of the group. After that our band of adventurers made a line of scooters and zipped through town. 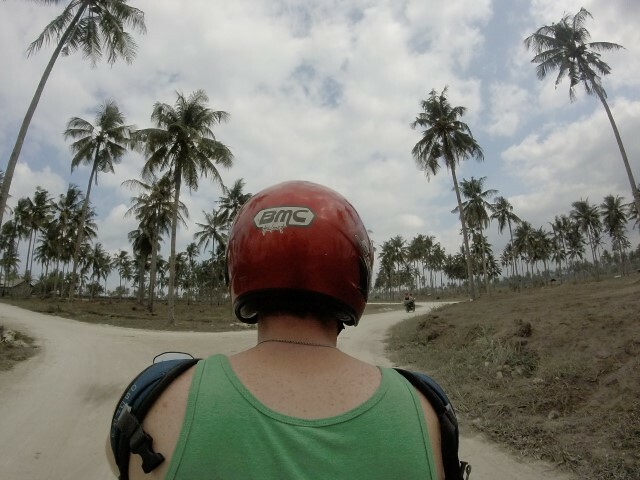 After a few minutes, we took a trail off the main road and found ourselves in the middle of palm plantations and local villages. We stopped at a man’s house and Din Din explained that he was a puppet maker. Hand crafted puppets are something that Indonesia is famous for. The puppet maker joyfully performed a short puppet show for us as we smiled and giggled in amusement. It was an entirely unexpected stop, yet a delightful one. After that we hopped back on our scooters and made our way to the Green Valley. 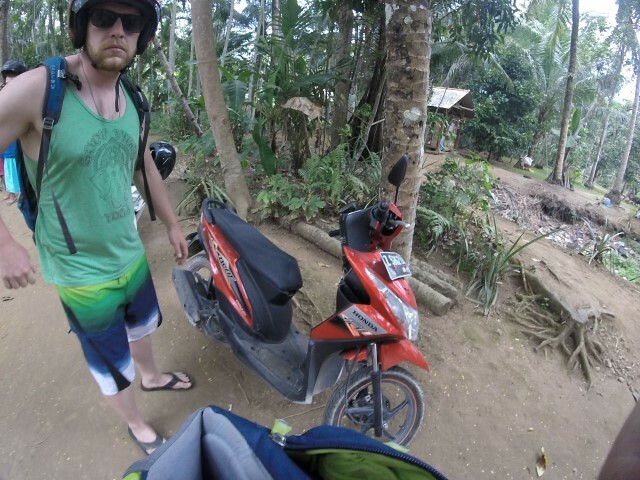 Here we left our bikes and walked into the jungle. 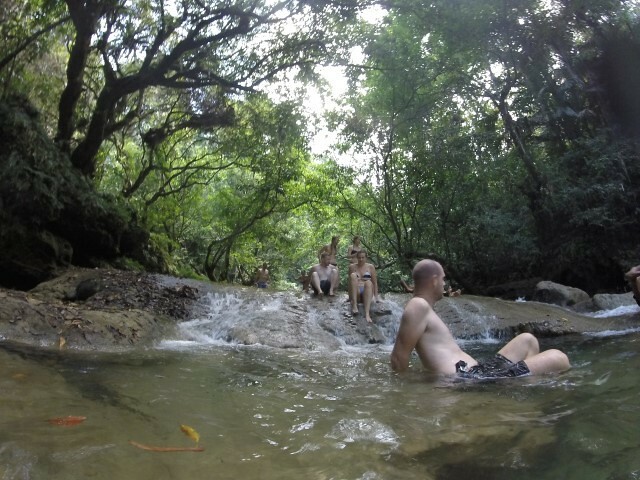 After about 20 minutes, we reached a beautiful waterfall that emptied into a big pool of crystal clear water. 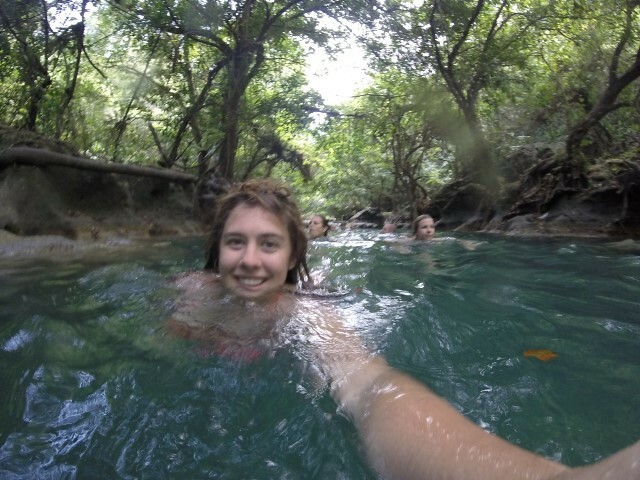 We left with only our swimsuits and go-pros and told to get in the water. 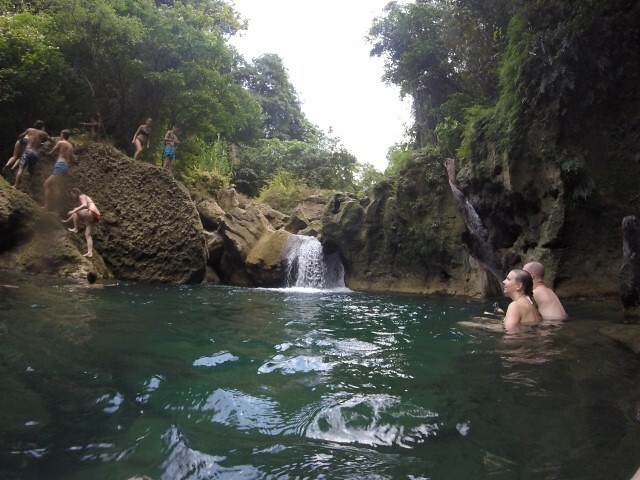 Once everyone was in, they asked if we’d like to jump off the waterfall into the water. Those of us who were brave enough decided to climb up on the rocks and jump in. This would be the theme of the rest of the trip. Once everyone who wanted to jump from the rock had finished, we were guided through a maze of water and rocks to the next spot. All along the river, it was a mix of jumping and swimming. 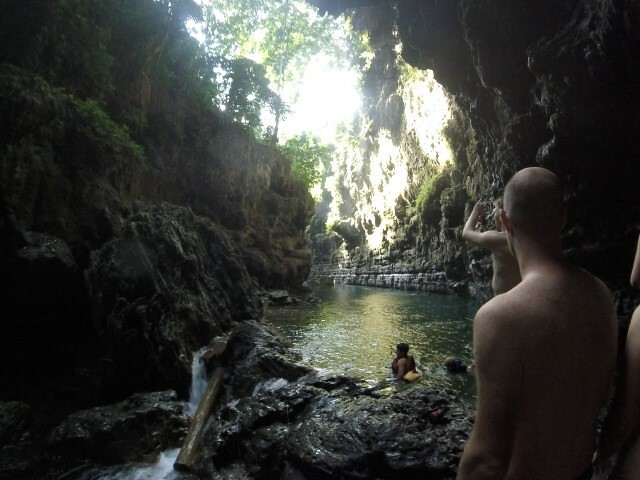 In the middle we reached a cave that we swam into. It was pitch black at the end and everyone was laughing and screaming. The guides swam around and scared people. It was terrifying, yet exhilarating. So many thoughts ran through my head as I was swimming into the abyss: I wonder if there’s alligators in here, this seems like a good place to commit a murder, I wouldn’t have done something like this when I was younger, wow it’s so dark in here. At that point, you just have to let go and enjoy it. The guides were extremely concerned for our wellbeing, so I was not very concerned about any of the jumping. 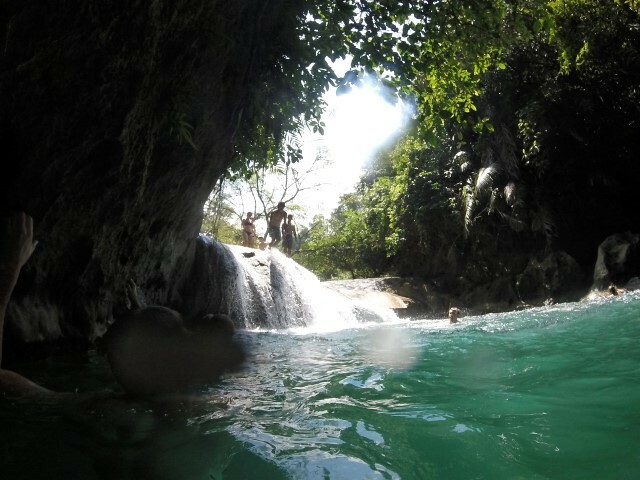 There were so many times while swimming in the fresh water and after jumping that I felt happier than I had been in a long time. It was the first time on the trip so far that I was just having so much fun. Previous experiences on the trip had been mind-blowing and interesting, but at this point I was just so full of joy and laughter. After swimming all the way back to our starting point where we left the scooters, a huge and delicious lunch was waiting for us. We stuffed our faces full of sticky rice, fried vegetables, chicken, tempe, and tea. We gathered up our bags and clothes and were reminded by Din Din, “make sure you haven’t forgotten anything, especially your sense of humor, ha ha ha”. He told us that at least 4 times that day. We hopped back on our scooters and made our way towards the Green Canyon. Here we were met with a couple boats that would ferry us into the canyon. 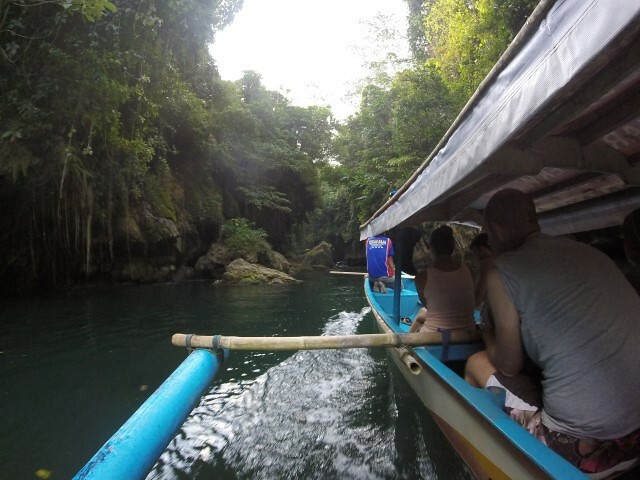 We entered a huge cavern and were told to leave our clothes and bags on the boat and get back in the water. 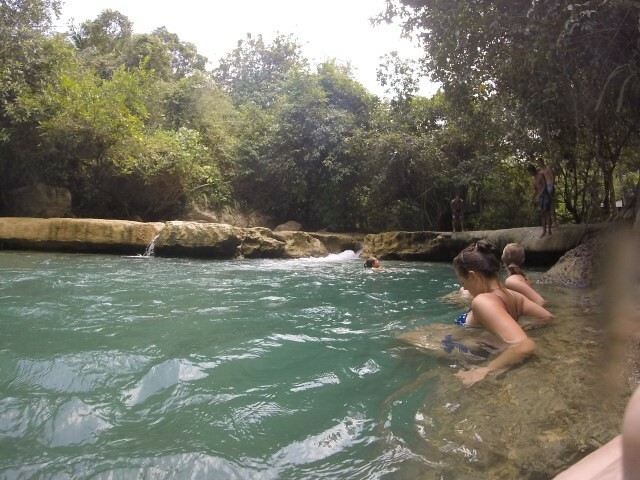 In here we swam more and jumped off more things. It was amazing to see the cave walls dripping water and move through the damp, mossy stones. 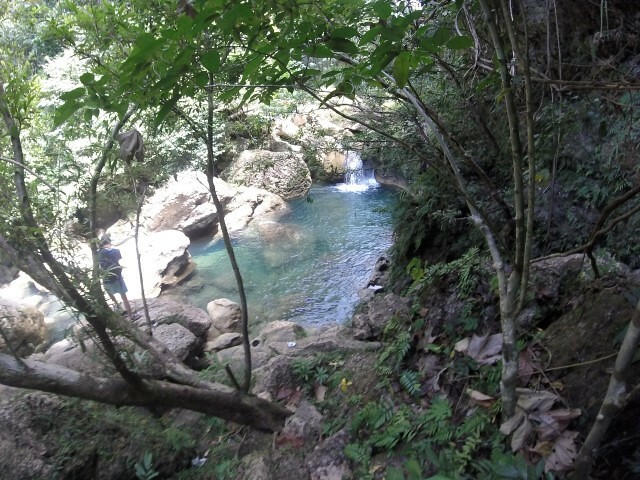 At the end, we reached a waterfall. 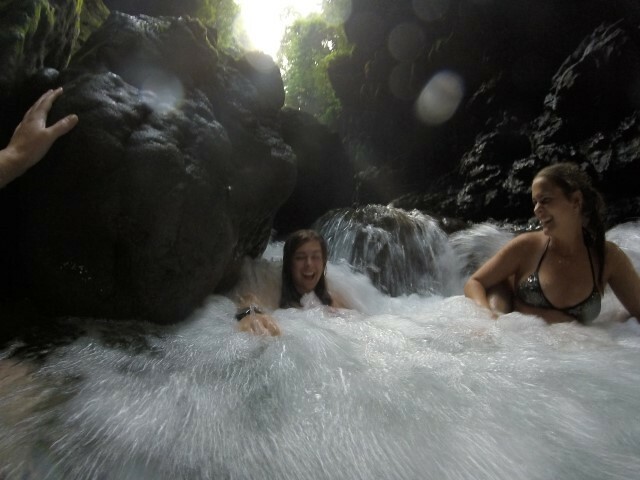 It was like natures jacuzzi. 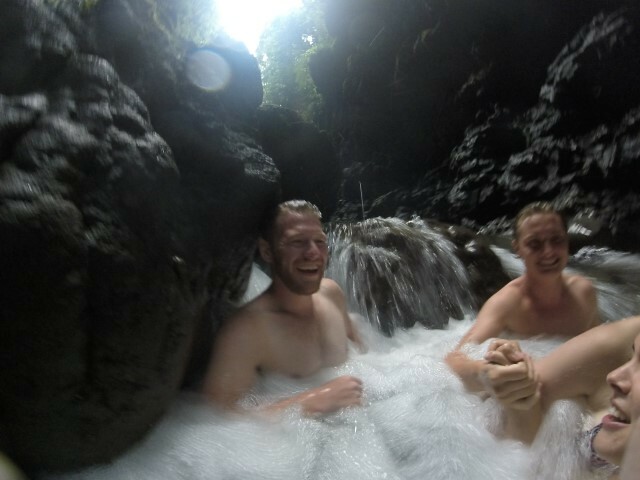 We piled into where the water rushed over us and laughed at the force of the water. Are There Alligators in Here? We returned back to the boats and then scootered home in the late evening. As we were heading back, I just remember feeling overwhelmed with bliss. It was the kind of joy that made all of the difficulties of traveling worth it. I felt proud of myself for having the courage to leave the comforts of home and go out and experience things like this. It was a truly wonderful day, and I’ll remember it fondly for a very long time. 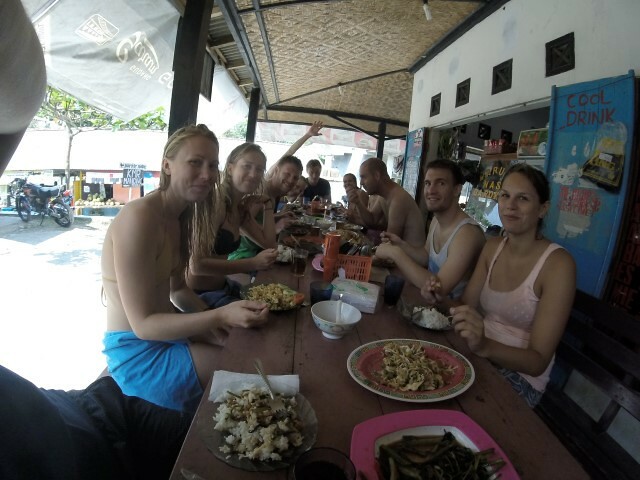 This entry was posted in Destinations, Narrative and tagged Indonesia, Narrative, Southeast Asia, Travel by Emily Upstrom. Bookmark the permalink. This looks like it was a blast. Good you had swimming lessons as a kid!